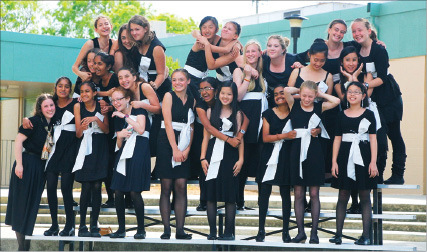 Bullis Charter School choir students participated in the annual California Music Educators Association festival earlier this month, receiving “Unanimous Superior” rankings – the highest score possible. Each of the school’s five choirs, spanning grades 1-8, performed three pieces, adjudicated by three different judges. The choirs, which included beginning and intermediate levels, earned the highest rankings possible from each judge. Sonore (comprising students in grades 4-6) and Mattiniere (grades 7 and 8), the intermediate-level groups, were tested on their sight-reading abilities. The choirs had to sing a two- to three-part song they had never seen before. Both choruses garnered “Superior” grades.